EWAN SHEARER of Bo’ness BC captured the WLBA Singles title for a second time in spectacular style at the Championship Finals played at Broxburn. 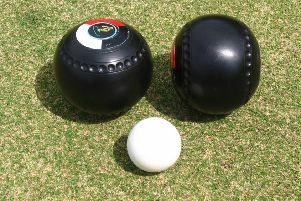 The 42-year old bowler went head to head with fellow Bo’nessian Stuart Williamson of Kinneil BC and showed his fellow townsman lots of respect but no mercy as he romped to a 21-3 victory in a super-quick 12 ends. Shearer produced a scintillating display of precision drawing that constantly smothered the jack. The Scotland cap previously etched his name on the Baillie Trophy in 2012 while other Singles triumphs in West Lothian include two Junior Opens, three District Singles and one Junior, one Masters, and four Champion of Champions titles. Meanwhile, the defeat of Kirkliston in the Fours was the major shock of the night with Queensferry – the first-ever champions in 1905 – capturing the glory with their rink comprising Colin Hamilton, Alan Grant, Raymond Reid and David Guild. The score after 13 ends was 13-13 then Guild and Co broke to 16 with a 3 but lost a 2 before coping with a nail-biting climax to card a 3 and clinch an 18-15 win over hot favourites Nathan McKendrick, Gordon Logan, Calum Logan and Grant Logan. Kirkliston faired much better in the Pairs with Andi Gray and Neil Speirs wiping out a 5-0 deficit to cross 11-9, then make space to 17 with counts of 2 and 4 en route to clinching a 20-12 win over Matt Thomson and Cameron Greer of Bathgate. The final of the Triples was an epic low-scoring battle with the Armadale trio of Stuart Sneddon, Kenny Martin and John Ellis adding two singles to clinch a 10-8 victory over Drew Paterson, Ian Robertson and James Speirs of Newbridge.